In the middle of all this moving madness, I am also helping plan my sister's baby shower. I am in charge of the decor, games, prizes and favors. Since I've been so busy, I decided to look at buying well priced (about $5 per favor) party favors that would save me time. But you know what? I couldn't find a single thing that was clever, well priced or plastic free. So I had to do what I normally do, which is make them myself. I thought about giving each guest a potted herb or a seed... but I wanted something a little more cutsie. Then I thought about making something with baby food jars... but then I couldn't get jars ordered in enough time. Then it hit me, combine the idea of a small jar, with the symbolism of an herb and make it edible without needing baking or cooking. 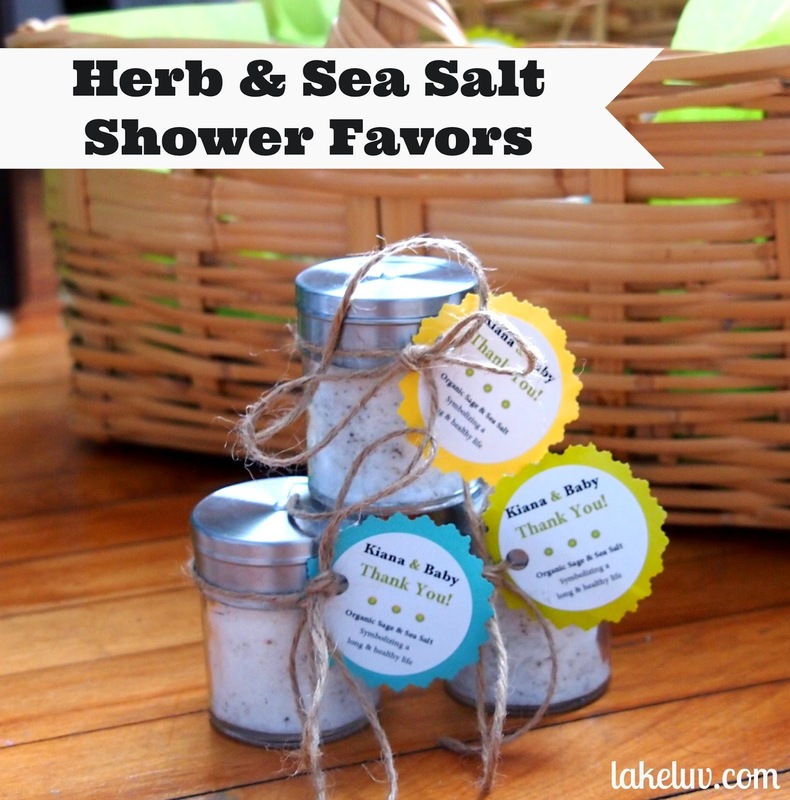 Enter the idea of giving away Herb Infused Sea Salt Shakers. Always useful, always needed. I hate gifts that guests are just going to throw out after the party. I decided to use Sage since it is an herb that symbolizes a long life, and salt, symbolizing good health. After all, we want this baby and all of our guests to all lead long and healthy lives, but you can really use any herb you prefer. For instance, Basil symbolizes love (maybe for wedding favors) and Thyme symbolizes courage and strength (maybe a gift for someone going through some tough times), so you can really get creative and give a meaningful and clever gift. I ordered little shakers, about the size of baby food jars in bulk and bought coarse sea salt, organic dried sage and table salt for the salt blend. I also had to buy round Avery labels to print on. I then re-purposed some liquor store gift bags into tags to hold the labels. Add some twine, and I have myself some lovely ingredients for cutsie baby shower favors. I just mixed 2 parts table salt to 1 part sea salt, and sprinkled the sage as I felt sufficient. I think they came out really well. Now let's hope the guests like these on Sunday!